When your baby’s teeth first begin to come in and you notice that gap between their teeth when they smile, the family may coo that it’s cute. "However, it is very important that if your child has a gap in their teeth due to a maxillary frenum, or another reason, that it be corrected," says pediatric dentist Dr. Cameron Fuller. Your child’s education, speech and self-confidence is dependent upon it being corrected at an early age. As your child gets older they are working on saying certain sounds. Children who are younger than five should be developing the ability to say all of the sounds. After five if these sounds are not solidified it will make it much more difficult for them to learn to correctly speak. “And by age seven if the sounds are not correct they run the risk of never being able to say them correctly,” says Dr. Cameron Fuller. By age five and six your child should be able to say their S’s and R’s correctly which are some of the last sounds to develop. Children who have speech delays may also be impacted in reading. Learning to read is dependent upon a child’s ability to correctly hear and blend more complicated vowel teams together. If your child is always saying some sounds incorrectly their brain and ears will hear the sounds that way long term. Unfortunately, by third grade a student who is delayed at that age runs the risk of never catching up to grade level. If your child is impacted by a gap due to a maxillary frenum that is stretched between their front teeth, as they get older, it may increase in thickness stretching the teeth wider and wider. Call Dr. Fuller and his team today for a consultation. Thank you for the information. I honestly had no idea gaps could be dangerous. Is there a size margin that dictates when it's necessary to fix it? I understand the dangers of a child not learning to speak correctly all to well. It's much easier for them to learn as children. If the gap is wide enough that it is impacting certain sounds it should be looked at by a pediatric dentist. My babies first teeth started coming in a few months ago and I'm noticing a gap. Do I take her into the dentist right away or wait? Thanks for this information. Please keep posted. Is the gap there due to a maxillary frenum? This is the thick piece of skin that attaches the gums to the lip. Sometimes, it comes between the teeth instead of being up higher on the inside of the lip.If so, I would have it looked at right away. Otherwise, you can wait until her first dental appointment, which should be scheduled when her teeth first begin to come in. That is interesting how big of a difference a gap can be for children. I remember when I was little I had a small gap between my teeth. My dentist was watching it closely and ended up getting me braces. Without my dentist paying attention to that, I bet I still would have a gap. We are glad that you found the information useful. A great dentist is definitely the key. 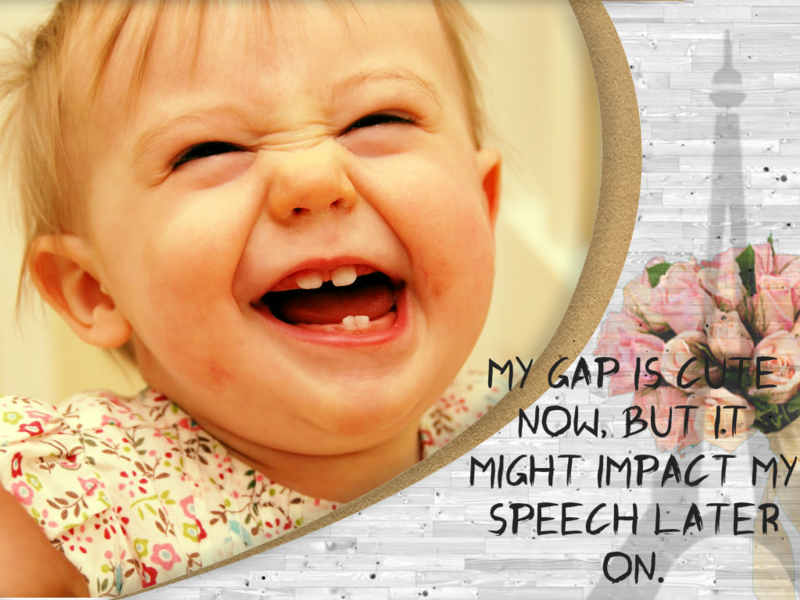 I had no idea that a gap in a child's teeth could effect speech later. I have a young son and I'll be sure to keep this in mind. I think that dental care is very important and begins at a young age. Amber, you are absolutely right. Great habits from a young age develop into individuals developing fantastic dental habits as adults. Have a great day. I recommend you always ask your dentist if you have concerns about something with your children's teeth. However, if they do not have gaps now, continuing regular dental check-ups will help catch any problems early. Thank you for taking the time to comment. Your comment will be approved after it has been read by one of our staff. One of the most common conditions affecting children's teeth are dental abscesses. Children with severe cavities often have teeth that abscess. Dental abscesses often start out as large cavities on the teeth. Once the cavity invades the pulp of the tooth the infection spreads to the bone. At that point the tooth is no longer salvageable. A dental abscess is a swelling of the tissue around an infected tooth. The following symptoms may result from a dental abscess. Children can often present with facial swelling, fever, altered eating habits, poor concentration, poor sleep patterns, breathing problems, and general malaise. The treatment that is always recommended is antibiotics and extraction. Why Should I Have Cavities Filled On My Child’s Baby Teeth? While preventive dental care is critical to your child’s permanent teeth, it is even more important you provide dental care for their baby teeth if they end up with a cavity.Baby teeth are important to the success of your child’s adult teeth. Decay, can spread and the damage it causes can last a lifetime. While you think that their baby teeth are going to fall out and the decay will be gone, this may simply not be the case. does your child need a crown? how much is enough fluoride in children? My children are afraid of the dentist? Should I fix my son's crooked teeth? What is a maxillary frenum?